Police Chief Mike O'Brien says this is a positive thing - it means business owners are standing up to shoplifters and pressing charges. Since they put it in place in 2017... they've arrested about 50 more shoplifters. Boxes action news now now's hayley watts is live with a breakdown how the program works and it's economic impact. Reporter lauren - police say businesses are finally standing up to pkg "we catch a few of them but often things just come up missing, you can't really keep on track of everybody when they come in", said mike trowbridge, who's worked in chico retail for 20 years. Thanks in part to prison realignment laws, chico police chief mike o'brien says in the past three years, shoplifting is up. "some businessess in chico were losing upwards of a quarter million dollars or more in retail loss," said o'brien. But a lot of business owners tell action news now they don't even try to catch shoplifting isn't a felony unless it's $950 or more. "my take is it's very dangerous, i don't want someone to chase someone down and get beat up for a $3 part ," said bud schwab. If business owners don't want to press charges there's nothing the police can do about it. "when shrinkage goes up, business owners have nothing else to do but raise prices or cut staff," said kelly torres at the chico chamber. Last year chico p.d, the dcba and the chico chamber asked business owners to start reporting, start prosecuting and start talking to each other. "we found one kid that stole from ltd on tape and he came in our shop and they notified us and we found him and held him in the shop til the cops came and got him," said mike trowbridge, north rim adventure sports. In a year's time, shopliftng arrests are up 20%. 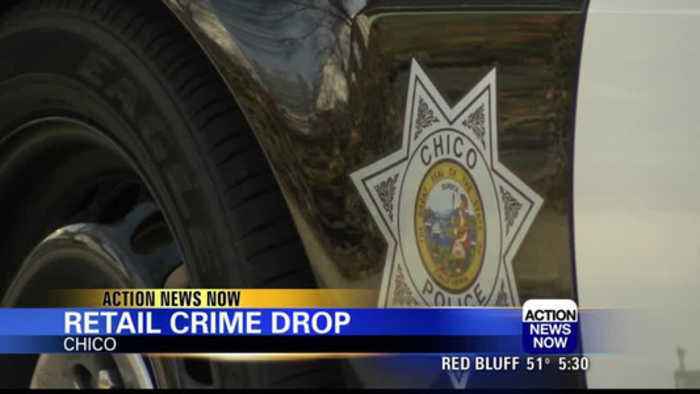 "we've seen leaps and bounds in phone calls for shoplifting," said chico chamber president kelsey torres. Meetings, retailers say they're seeing a difference. "we want to let criminals know that this in not acceptable, and police department are making a stand," said chief o'brien. ### reporter live the chief says this shift in culture is a slow process - he's heard shoplifters say they're so used to getting away with it, they're shocked they're being handcuffed. But, the change is happening. In chico hayley watts action news now.### on cam tag lauren lauren not every business is on board with the program -- we'll hear why, coming up at six. 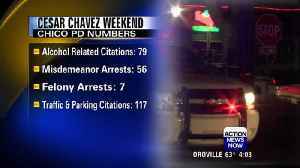 The Chico Police Department released numbers on arrests and citations given out in the city during Cesar Chavez Weekend.